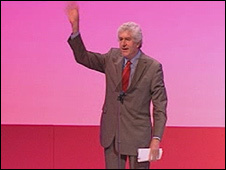 So what happens next, now that First Minister Rhodri Morgan has finally confirmed his departure as both leader of Welsh Labour and the Welsh assembly? We enter the complicated world of internal Labour politics. The election to replace him goes through a series of stages before an "event" is held to unveil the new leader. A meeting is convened of the party's executive committee in Wales, the body which runs Labour in Wales and will be overseeing the election of its leader in the assembly. Yes, we all know it's for the top job - the Labour leadership in Wales - but technically it is for the leadership of the Labour group in the assembly. The executive committee has 36 members, and includes representatives of constituency Labour parties, MPs and Assembly Members. They are responsible for calling the election and setting the timetable. There is a period of 10 days when AMs have the right to declare that they are standing, with the backing of six AMs. Technically no candidates are meant to declare before this, but party managers know the reality. The only runners are widely assumed to be Counsel General Carwyn Jones and Merthyr Tydfil and Rhymney AM Huw Lewis, along with Health Minister Edwina Hart, who has said she is "flattered" that she has the backing of fellow minister Andrew Davies. All the potential candidates have been pretty well behaved so far and carefully avoided open statements they want the job. Members of the Labour movement in Wales have a chance to "express support," as officials put it. So that's MPs, Labour's sole Welsh MEP, Derek Vaughan, constituency Labour parties and "affiliates", which are unions and "socialist societies"- such as the Socialist Health Association - affiliated to Labour. They have a chance to put their endorsements on the glossy literature that will go out to members. Ballot papers are issued - all overseen by an "independent" balloting company, officials are keen to stress. Five hustings meetings will be held, one in each assembly region, involving all candidates. These will be closed for party members - but fear not - another hustings meeting is likely for the media so we can all get involved. Voters have to rank their preference and candidates who get the least votes knocked out until someone has reached over 50%. All these votes are counted according to the three sections of an "electoral college" - with MPs, AMs and the MEP Derek Vaughan in one, ordinary members in constituency Labour parties in another, with unions in the third. Each section is worth a third of the final vote. Crucially this time the unions will NOT be casting their votes as a "block" vote for one candidate but in proportion to the way members cast their ballot. The winner is announced. We don't know how yet, but it's going to be an "event," say officials. It's all meant to take eight weeks and is a pretty major logistical exercise - Labour officials are working on a print run of 250,000. Not easy, and there could be some interesting hustings with Labour colleagues - and cabinet members - saying how different they are from each other. But as Mr Morgan scores so highly in terms of public recognition as first minister, anyone who succeeds him will have an even greater problem if they want to say how different they are from him.